1. Preheat the oven to 375°. Heat the oil in a large saucepan. Add the garlic, green pepper, onion, ginger and 1 teaspoon of salt and cook over moderate heat, stirring occasionally, until the vegetables are softened, about 8 minutes. Add the diluted Sweet and Sticky Barbecue Sauce and all of the beans and simmer over low heat for 30 minutes, stirring occasionally. 2. 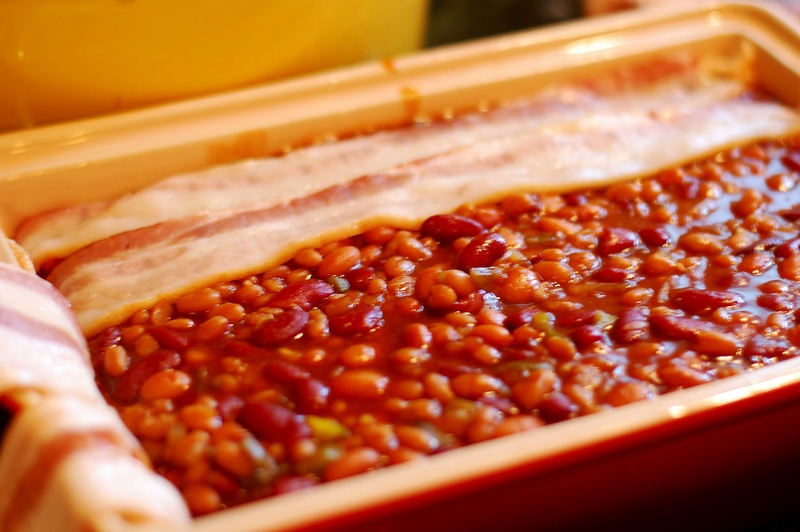 Transfer the beans to a 9-by-13-inch baking dish and arrange the bacon strips on top. Bake the beans for 45 minutes, or until bubbling and the bacon is crisp. Let cool for 15 minutes before serving. The beans can be made through Step 1 and refrigerated. Bring to room temperature before baking. Adam Perry Lang uses an ingenious technique to prevent his barbecue sauce from burning on the grill: He mixes it with an equal amount of water. This lets him brush it on up to 45 minutes before the meat is finished cooking. The flavors of the sauce become wonderfully complex and the meat develops a beautiful, shiny glaze. 1. Heat the oil in a large saucepan. Add the garlic, onion, green pepper and a large pinch of salt and cook over moderate heat, stirring occasionally, until softened, about 10 minutes. Add the rum and simmer for 2 minutes. Add the chili powder, black pepper, allspice and cloves and cook, stirring, until fragrant, about 3 minutes. Add the brown sugar, water, ketchup, molasses, mustard, vinegar and hot sauce and simmer over moderate heat, stirring often, until thickened, about 30 minutes. 2. Transfer the barbecue sauce to a large food processor and puree. Season the sauce with salt. Make Ahead…The barbecue sauce can be refrigerated for up to 2 weeks.Serve With Barbecued Baby Back Ribs.